We welcome you and your family to our happy school where the successful partnership of children, parents and teachers is the foundation of a caring, learning community. Schools vary enormously in achievement and atmosphere. 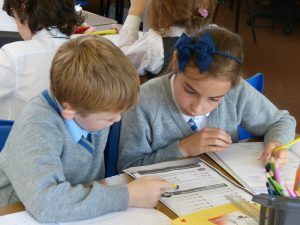 Our distinction lies with the children in our school; they are polite, hardworking and well behaved. We appreciate this does not necessarily set them apart from other children in the district but this is allied to the sense of order and calm that prevails around the school. The quiet confidence and caring attitudes which are the hall mark of our children make Thorn Grove a very special school. At Thorn Grove we pride ourselves on wanting to create a school where individuals thrive, feel motivated and fulfil their potential. We aim to create a community that works together, supporting and challenging each other to achieve the best possible outcomes. We believe that it is our duty to provide an education that is accessible to all which inspires and stimulates creative thinking and a growth mind set. We know that if we achieve all this in a nurturing, caring environment we will fulfil our community motto: Aim High, Succeed and Fly! We aim to provide all of these in a safe, caring and inclusive environment. Thorn Grove is an average-sized primary school for children from 3-11 years. It includes a deaf base resource provision run by the local authority. Many pupils from this unit are taught in the mainstream classes as inclusion lies at the heart of the school’s ethos. The school was built in 1951 and benefits from generous accommodation. The main building has eight classrooms, an ICT suite, a spacious library entrance foyer, an assembly hall, separate dining room and an administrative area. Two pairs of demountable classrooms provide valuable additional teaching space. There are two separate playgrounds, two outdoor learning areas (Nursery and Reception) and extensive well maintained playing fields. A private day nursery (Elm Cottage) also operates on the site looking to provide wrap-around care for babies to 3 year olds. The school occupies a 5 acre site.